Xsynth-DSSI is a classic-analog (VCOs-VCF-VCA) style software synthesizer which operates as a plugin for the DSSI Soft Synth Interface. You can hear some samples of Xsynth-DSSI at Brian Collins' excellent linuxsynths.com site. Xsynth-DSSI is written by Sean Bolton, and licensed under the GNU General Public License, version 2 or later. When developing open-source software for a niche market such as Linux audio, it can be hard to know how many people are using one's work, and to feel like it's worth the effort to maintain it. offers of paying work writing this sort of code! DSSI version 0.9 or greater. liblo version 0.12 or later (0.23 or later recommended), a library implementing the Open Sound Control (OSC) protocol. the ALSA headers (DSSI plugins use ALSA structures, but not the actual drivers, so you don't necessarily need the drivers installed.) Users of non-Linux systems can use libdssialsacompat. a working DSSI host. Xsynth-DSSI has been tested with jack-dssi-host, available in the DSSI distribution, and with ghostess. automake 1.7, autoconf 2.58, and libtool 1.4.3 or better if you wish to recreate the build files. 'cd' into the package directory and execute './configure'. configure will add '-Wall' and my favorite optimizations to CFLAGS for you if you don't include any '-Wall' or '-O' options. If you're using gcc and wish to provide your own optimization flags, you MUST at least use '-finline' and a non-zero '-O' flag to get decent results. Enable debugging information if you desire: edit the file src/xsynth.h, and define XSYNTH_DEBUG as explained in the comments. Feedback on your experiences building Xsynth-DSSI is appreciated. jack-dssi-host should start, and moments later the Xsynth-DSSI graphic user interface should appear. Use aconnect or kaconnect to connect jack-dssi-host to a MIDI source, such as vkeybd. Begin playing sounds! 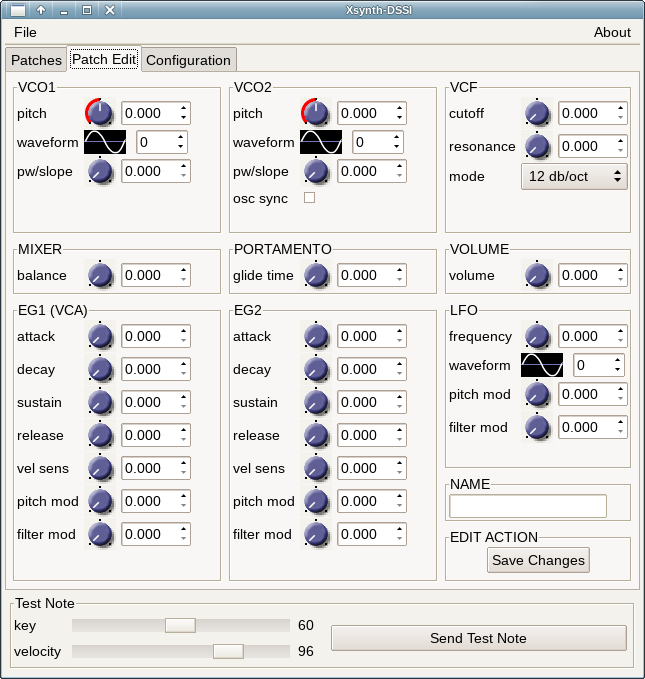 If you get no response, try clicking the 'Send Test Note' button in the Xsynth-DSSI GUI. This sends a note directly via the host to the plugin, so if you hear sound now, look for a problem between the example host and your MIDI source. If you still don't hear sound, I'd look for a problem between the example host and your output device. If you continue having trouble, you might recompile with XSYNTH_DEBUG bit 2 set, which will cause the plugin to continuously output a quiet buzz to help debug your outgoing signal path. Xsynth-DSSI starts up with a small set of sound presets, or 'patches', that you can select either by selecting the GUI 'Patches' tab and clicking on the patch name, or by sending a MIDI program change from your MIDI source with the appropriate program number. You may load additional patches by selecting 'Load Patch Bank...' from the GUI 'File' menu, and pointing the file selection dialog to a Xsynth-DSSI patch bank file. One such file is patch_library.Xsynth, which is installed with the plugin, in <prefix>/share/xsynth-dssi/. After selecting a patch bank file, you will be asked at which program number to begin loading the new patches. This allows you to overwrite the existing patches, or to add the new patches at the end. Note that if the starting program number you select, plus the number of patches in the patch file, exceeds 128, the additional patches will not be loaded. Selecting 'Save Patch Bank...' from the 'File' menu will allow you to save your patch bank to a file. After specifying the file name, you will be asked to specify the range of patches to be saved. Selecting the 'Patches' tab displays a list of all the patches loaded. Clicking on the name of a patch causes that patch to be selected. The 'Test Note' controls allow you to send a test note to the plugin, by clicking on the 'Send Test Note' button. Changing the 'key' and 'velocity' sliders will change the pitch and velocity of the test note. A key of 60 is generally considered to be 'Middle C'. This tab allows you to edit patches. The controls in the VCO1, VCO2, LFO, MIXER, PORTAMENTO, EG1, EG2, VCF, and VOLUME sections all offer real-time control of the synthesis parameters used by the plugin to create sound. The voice architecture is described in more detail below. Clicking and dragging a knob with mouse button 1 sets the value directly, by making the knob pointer point toward the mouse pointer. Clicking and dragging a knob with mouse button 3 allows incremental adjustment of the knob's current value (without a sudden jump.) Horizontal movement produces large variation in the knob value, while vertical movement allows finer control. Clicking on a knob with buttons 1 and 3 increment and decrement the knob value. The NAME text box allows you to change the name of a patch. Sets the tuning of this instance of the plugin, as Hz for A-above-middle-C.
Sets the maximum polyphony for this instance of the plugin. If you attempt to play more notes than this setting, already-playing notes will be killed so that newer notes can be played. If you are getting xruns, try reducing this setting. 'On' - monophonic operation, where the envelopes are retriggered upon each incoming note on event. 'Once' - monophonic operation, where the envelopes are triggered only on the first note on of a legato phrase -- that is, if you hold one note while playing a second, the envelopes will not be retriggered for the second note. 'Both' - monophonic operation, where the envelopes are retriggered at each note on, and upon note off when other keys are still held. 'Legato Only' - portamento (a 'slide' in pitch between two notes) is only used when a new note is played while another is held. 'Non-legato Only' - portamento is only used for single (staccato) notes, or the first note of a legato phrase. 'Always' - portamento is always used. 'Leftover' - like 'Always', but ... more difficult to predict. Set the pitch bend range, from 0 to 12 semitones, for this instance of the plugin. Modulation of these elements is possible using two envelope generators (EG1 and EG2), a low-frequency oscillator (LFO), and the MIDI key and velocity. The frequencies of VCO1 and VCO2 are controlled by the MIDI key, plus the value of the 'pitch' control. Compared to a base pitch of '0', a value of '5' is one octave higher, and a value of '10' is two octaves higher. The pitch from the MIDI key may be lagged by the PORTAMENTO 'glide' value, as determined by the glide mode and other keys in play (see above). The frequency of VCO2 is also affected by the 'pitch mod' amounts from EG1, EG2 and the LFO. The 'pw/slope' control sets the width and slope of waveforms 5 and 6, respectively. It has no effect when waveforms 0 through 4 are selected. VCO2 may be 'hard synced' the VCO1, so that its phase resets whenever VCO1 completes a cycle, by selecting the 'osc sync' checkbox. A 'balance' setting of '0' causes the mixer to output only VCO1, a setting of '10' outputs only VCO2, and a setting of '5' results in an equal mix of both. The VCF cutoff frequency is set by the 'cutoff' control, plus the 'filer mod' amounts from EG1, EG2, and LFO. The filter resonance, or 'Q', is set by the 'resonance' control. Be aware that the filter is not always stable when the resonance is very high, and when the resonance is very low but the cutoff is very high. '12 db/oct' - the original Xsynth two-pole filter. '24 db/oct' - the original Xsynth four-pole filter. 'MCVLPF-3' - Fons Adriaensen's MCVLPF-3, modeled after the voltage-controlled lowpass filter invented by R. A. Moog. The gain of the VCA set by both the 'volume' control and the envelope generator EG1. The envelope generators are classic 'ADSR'-style: the 'attack' control sets the time it takes from key-on for the envelope to reach full output, the 'decay' control sets the time it then takes to fall to the 'sustain' level, where it stays until key-off. The 'release' control sets the time it then takes to fall back to zero output. The 'vels sens' (velocity sensitivity) control determines the amount the envelope output is reduced by low MIDI velocities. At a sensitivity of '0', the envelope always goes to full output. At maximum MIDI velocity (127), the envelope always goes to full output. Otherwise, the lower the velocity and higher the sensitivity, the greater the reduction of the envelope's output. The duty cycle of the waveform 5 (rectangular) is fixed at 25% high, and waveform 6 (variable-slope triangular) is not available. MIDI Control Change 5 "Portamento time" is mapped to the PORTAMENTO 'glide' control, although in a somewhat backward way: higher CC values map to shorter glide times, and lower CC values to longer glide times. MIDI Control Change 8 "Balance" is mapped to the MIXER balance control. MIDI Control Change 7 "Volume" controls the output level, without affecting the VOLUME control. MIDI Control Change 1 "Modulation wheel" reduces the VCF cutoff. MIDI channel pressure and key pressure are combined to boost the VCF resonance. Q1. Woah! Where'd that nasty sound come from? Volume too high: especially when using high resonance, your signal may be so hot it's clipping. Resonance too high: yep, the filter will go to self-oscillation with high resonance settings. Try backing the resonance off. Resonance too low: Xsynth's filter is unstable near zero resonance when used with high cutoffs. Try setting the resonance to 0.2. XSYNTH_DEBUG XDB_AUDIO set: if you've got a ~600Hz buzz in the output even when you're not playing anything, your plugin was probably compiled with the XDB_AUDIO debug bit set. Fix that and recompile. Pitch too high: even with the band-limited oscillators, it is possible to get audible aliasing on very high notes. This is especially true when using oscillator sync while VCO2 is producing a sine wave, since the band-limiting technique doesn't deal as well with waveforms having continuously varying slope. Q2. Help! I just installed Xsynth-DSSI 0.9.x, and now my sessions that used the older Xsynth-DSSI 0.1.x don't sound right. What should I do? Q3. Why aren't the GUI slider values and the corresponding LADSPA port values the same? A3. The LADSPA port values are the actual numeric values used by the synthesis code, while the GUI slider values are all the 0-to-10 values used in Steve Brookes' original Xsynth interface. Q4. Why aren't my patch edits being saved between sessions? A4. When you edit and save patches, the patch data (which is really just the settings for the DSSI plugin ports) can exist in four places, only two of which may persist between runs. Twiddling the knobs in the Xsynth-DSSI Patch Editor, or in your DSSI host's port editor, changes the values the plugin is currently using to make sound (represented by the leftmost box in the diagram below.) If you want to save your edits as a one of the patch ‘Presets’ (the middle box), use the ‘Save Changes’ button on the Patch Editor. Note that the middle box only exists in the plugin's working memory, and if you want to permanently save your changes, you need to get them to one of the boxes on the right. One option is to use ‘Save Patch Bank...’ from the ‘File’ menu, so save the patch bank to a file (the bottom right box) which you can then reload later using ‘Open Patch Bank...’. The other option (the top right box) is to use a DSSI host which will save the session data for you, and restore it upon reopening the session (not all hosts do this). Until you fully understand how your host works, it's best to save a file, too. Xsynth-DSSI is written and copyright © 2017 by Sean Bolton, and licensed under the GNU General Public License, version 2 or later. It includes contributions and bits of borrowed code from many others, all under various copyleft or non-copyleft open-source licenses. See the file AUTHORS for details. In particular, if you're interested in Steve Brooke's original Xsynth, the code can still be found here.